Today, when you order "Digital Conviction by Robert Smith", you'll instantly be emailed a Penguin Magic gift certificate. You can spend it on anything you like at Penguin, just like cash. Just complete your order as normal, and within seconds you'll get an email with your gift certificate. Digital Conviction by Robert Smith (DVD) A photo taken on a borrowed cell phone CHANGES to match the spectators chosen card. The perfect "going out" trick. NOW SHIPPING. HIGHLY RECOMMENDED. Order in the next 9 hours 2 minutes and it will ship TODAY! 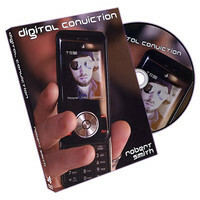 Digital Conviction is an amazing effect that can be performed anywhere and anytime with all borrowed objects. Everything is completely ungimmicked and examinable and the spectator keeps a souvenir that will surely make you unforgettable. Here is what happens in the effect. You approach the spectator and remove a joker or any card out of the deck. "We will use this as the wild card but we'll get back to that in a moment. Please will you select any card?" The spectator has a free choice of any card, nothing is forced. The selected card then gets lost in the deck. "Let's get back to the Joker." You remove the joker and place their initials on the corner of the joker. "Remember the joker is the wild card. Let's make this moment more memorable and take a picture." You now borrow their camera phone and take a picture of the joker with their initials. The spectator confirms that the picture on the camera phone is the initialed joker. The phone is immediately handed to the spectator and placed face down in their hand. "If I take the joker that we just took a picture of and give it a shake you can see that it changes to your selected card". With a closer examination the spectator sees that her initials are now on the selected card. Now you go in for the kill. "If that card changed in my hand then the picture in your hand should have changed too!" BIG reaction as the spectator just realized that they saw you take a picture of a joker with THEIR initials on it and it changed to their selected card with their initials on it. This effect is huge and it's a worker. 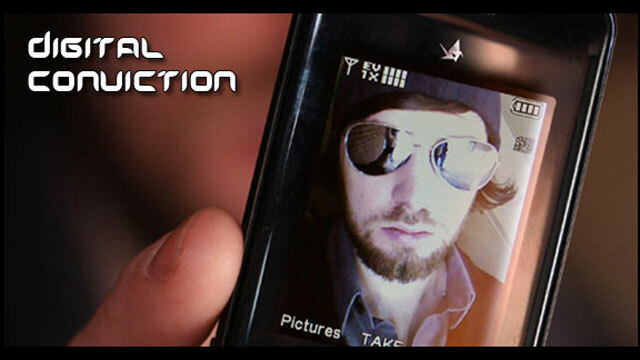 Also as an added bonus you will receive an additional bonus effect using cards and a camera phone. If you are looking for an effect where you don't have to carry any extra material and an effect you will actually do, then Digital Conviction is for you. The thing that sold me on this trick on the demo, was the fact that you could see the photograph of the Joker briefly before the phone was placed down on the spectator's hand. This effect may have worked 5 years ago when most people still had a flip phone. Today's smartphones don't have the lag that is necessary to create this effect. Without this lag effect, the trick is still decent, but nowhere near as powerful as it could be. I give this 2 stars because without the spectator being able to see the picture of the joker, this effect becomes merely a trick instead of real magic. This is a wonderful trick to do at parties. No gimmicks and nothing to prepare. Everything can be borrowed. This is the kind of magic that I like. The DVD is excellent. I wish more tricks were this easy with so much impact. My favorite trick to date! Wow! This trick is pretty good and requires a little bit of sleight, but I'm a beginner and with a little practice, I can easily pull this off. For those of you thinking, oh this trick requires the phone to have delay on it, YOU'RE WRONG! At the end of his video is a GREAT bonus effect (another cell phone trick) which is even EASIER than the digital conviction trick! For all of this, you can't really beat the price. I could hardly endure the instructions on this DVD. The magician is clearly a good magician who has little or no teaching skills. 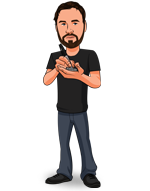 His style is very disorganized and mixes in a lot of detail while he is showing you the mechanics. The illusion is good an cost effective - it just needs a much better instructional dvd. The thinking behind this works but...you need to be good at cardistry or have a vested interest in it to pull it off. The psychology behind every move is so seamless, you can't really tell that 2 things are actually occuring at once (the presentation & the dirty work). One mixes into the other, quite well i might add. I would agree that the explantation is lacking. The others that have rated this as amazing and what not, I would suspect deal with cards quite often which is fine but that does not take away form the fact that the explanation is lacking. Lastly the fact that seasoned magicians would belittle a novice for being new or not having a interest in card magic is sad. Reminds me of the cool kids in high school that you meet 10 years later only to find out they work at Wendy's full time. In conclusion great thinking and cleverly disguised effect. Explanation lacking. Good for those interesed in card magic and love sleight of hand. I personally will not be performing this. This is a great trick, used right its perfect for any one, simple to learn and blows people away! When I received this I was excited to learn it but was a little disappointed with some parts of the method. I felt like it could've been a bit simplified and some things either didn't translate well to me or were just no realistic in applying to a real-world situation. Overall, this was my first Robert Smith purchase but i will hold off til I get more things from him before making a full critique. I like the concept of this trick and I think it has potential. The trick is exactly as they say it is. The angles aren't very good though and it just doesn't get very big reactions. It's a cool fooler, but lacks the WOW factor.